Had one this past week for the first time...pretty nasty and I was not happy I took you word for how good it is. NAS-TYYYYY!!!! The best thing on this sandwich is the pickle. It amazes me that the McRib is so popular. I worked closing shift at a McDonald's during high school when the McRib made an appearance (this would have been sometime in 1990-91). Part of closing is cleaning everything, including the big metal trough holding the sludge that was the leftover McRib sauce. If you had seen that, you would never touch one of them. 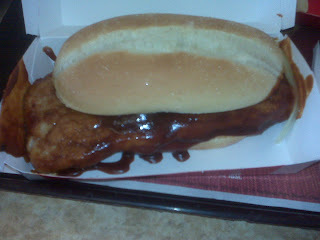 I think that was the 2nd coming of the McRib. I clearly remember getting them back in the mid-80's...that and the McD.L.T. Anyway, the thought of eating one now makes me want to McPuke into a McBucket of my own McShit. Why so much hate for a mostly inanimate, well-sauced ribwich? I plan on having one for supper tonight (my third since the roll out). As for what's leftover in the "trough," the leftovers in any fast food establishment are gross. After working fish fries at a Perkins after my senior year in high school up in Bradford, I couldn't eat fish for a year. That sandwich is just straight nasty man...maybe my expectations were too high. but Dude, it's McDonalds, how high could your expectations possibly be? Ha...this is true. Excellent point. That leftover sludge is just the sugar caramelizing. I worked at Mickey D's during the mid-90's and remember eating one here and there, but I honestly didn't get what the big deal was with that sammich.